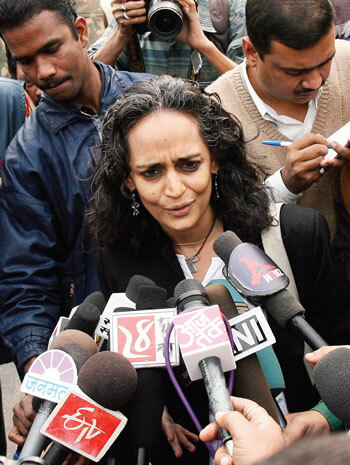 Writer Arundhati Roy’s home is attacked by a mob protesting her position on Kashmir. The democratic tradition in India is only skin deep. It’s as superficial as the skins or membranes we buy to put on expensive cellphones and other gadgets. You realize this whenever a public figure criticizes the government, or generally adopts an unpopular position. How dare they? A virtual fatwa is issued against the offending party by irate citizens with not even the slightest pretence that they might have the right to express their views, whatever these may be. So after weeks of outrage expressed on Twitter about the writer Arundhati Roy’s stance on Kashmir (that it should be allowed to secede) today the inevitable happened. A horde of protestors accompanied by TV cameras lynched the writer’s home, vandalizing property and shouting slogans at her and her family. As fellow writer Salil Tripathi tweeted: Everytime Arundhati Roy writes or speaks, she incites people and there’s unrest, demonstrations, and threats of violence: erm, against her. If only people would get their knickers in as much of a knot over serious things like the corruption that was highlighted during the Commonwealth Games or the scandal over the Chief Minister of Maharashtra allotting several posh apartments in a fancy building to himself and family members. To make matters worse the building “originally meant to be a six-storey structure to house Kargil war heroes and widows … was later converted into a 31-storey tower, apparently in violation of environmental laws,” and divided up among top politicians and army personnel in Mumbai. How on earth is it that in the face of such crimes people can find the time to lynch a writer merely for expressing her views? And even if some people were foolish enough to do this how come members of the media accompanied the unruly protestors to the location and stood by doing nothing while the writer’s house was attacked? Is this the Indian version of ’embedded media’? Below is the statement issued by Arundhati Roy on the mob attack this morning. What is the nature of the agreement between these sections of the media and mobs and criminals in search of spectacle? Does the media which positions itself at the ‘scene’ in advance have a guarantee that the attacks and demonstrations will be non-violent? What happens if there is criminal trespass (as there was today) or even something worse? Does the media then become accessory to the crime? This question is important, given that some TV channels and newspapers are in the process of brazenly inciting mob anger against me. In the race for sensationalism the line between reporting news and manufacturing news is becoming blurred. So what if a few people have to be sacrificed at the altar of TRP ratings? The Government has indicated that it does not intend to go ahead with the charges of sedition against me and the other speakers at a recent seminar on Azadi for Kashmir. So the task of punishing me for my views seems to have been taken on by right wing storm troopers. The Bajrang Dal and the RSS have openly announced that they are going to “fix” me with all the means at their disposal including filing cases against me all over the country. The whole country has seen what they are capable of doing, the extent to which they are capable of going. So, while the Government is showing a degree of maturity, are sections of the media and the infrastructure of democracy being rented out to those who believe in mob justice? I can understand that the BJP’s Mahila Morcha is using me to distract attention the from the senior RSS activist Indresh Kumar who has recently been named in the CBI charge-sheet for the bomb blast in Ajmer Sharif in which several people were killed and many injured. But why are sections of the mainstream media doing the same? Is a writer with unpopular views more dangerous than a suspect in a bomb blast? Or is it a question of ideological alignment? Is the damage to India so great that it justifies curtailing free speech? Obviously, it isn’t. No violence followed her statements and nor did she incite it. Moreover, there will still be an India with Kashmir as an integral part of it long after Roy herself is forgotten. So, let’s just cool down. We have a perfect right to dislike Roy. We are entirely justified in being angered by her statements. But the moment we compromise on the principles that make us a liberal society —especially when her remarks pose no real threat to us at all — we start playing her game. We become the repressive, authoritarian society she suggests we already are. This is an excellent counter PR attack by mentioning OB Vans arriving before the mobs etc. I would have expected a better response than trying to throw conspiracy theories. What happened? Ms Roy lost the storytelling touch? When you defend stone pelters why do you cry foul when those very stones are thrown back at you? Has Mr Roy tried to understand the reaction across the country towards her? If she hasn’t then she should up and leave this country she hates so much anyways. There are few things that binds this country unitedly. One of them is the feeling of nationalism and patriotism. When you use anti nationals to further your PR private causes and to get your sagging book sales a boost, you play a dangerous game and should be prepared for the consequences. The one book hit wonder should try and right another book instead of trying to rev up flagging sales of her first book using dangerous PR techniques. Arundhati Roy has published at least 10 bestselling books so she’s not a one-hit wonder! In fact the list of accusations you make against her–are you sure you have the right person in mind? I think you must be talking about someone else, a fictional character perhaps, because almost none of what you claim above is true! Ms Roy is another page 3 celebrity who tries to get into the media lime light at any cost. She left NBA because it wasn’t giving her the media attention she was seeking for. She claims to be an anarchist, so let her face the music of anarchy. After all thats what stone pelters do in Kashmir everyday. She justify the violence in Kashmir and the one propogated by Maoists. I dont feel any sympathy for her. Those who use the sword will die by the sword. Next Next post: Gaza mi seh!